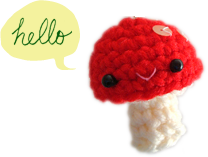 Remember I was crocheting along with the awesome Amy and the wonderful people at Knitorious via Skype? 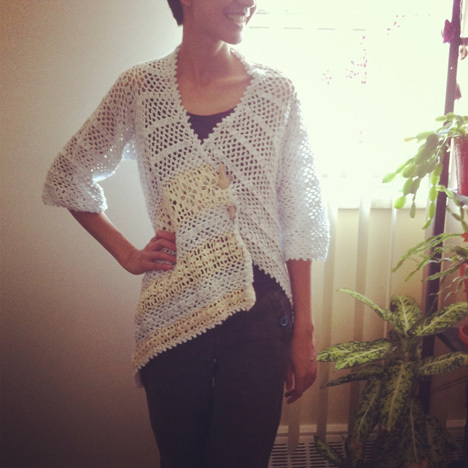 The cardigan is finished and I finally got around to taking a photo of it! I’m not sure why but the front piece with the beige lace panels seems a lot bigger than the other front piece. So it looks more like a wrap than a cardigan on me, but I think it looks alright. It’s a nice piece to wear to summer nighttime events! Really cute!!! Nice work and I think the wrap/sweater look is super cute on you! Looks beautiful on you, Trish! And using the driftwood piece to hold it together? Genius! I love the asymmetrical fronts! I’m looking forward to seeing it, too.